What is the one thing you would tell your colleagues about why they should have a laser in their practice? 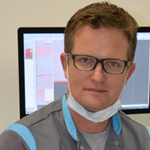 Dr. Kusek: The use of laser dentistry will change the way they practice dentistry. It makes procedures faster and very predictable for both the dentist and patient. It helps dentists increase the number of procedures that can be done in the office, when before they needed to be referred out. It makes procedures a win-win for both the patient (faster healing, less pain, less post-op treatment and complication) and for the doctor (less chair time for the doctor, fewer post-op visits and complications and higher profit margins by decreasing chair time). Dr. Kotlow: It makes common sense to invest in your patients by using lasers since it will reduce patient anxiety and stress at going to the dentist, reduce the number of appointments to complete some dental care, reduce time lost from school for children and reduce time lost from work for parents and adults. In addition, dentists who learn how to safely and correctly use their lasers will see an increase in income and productivity. Dr. Hoopingarner: They will be able to recognize and treat conditions they do not treat now in a manner that is more comfortable and desirable for their patients. Dr. Low: All healthcare is moving towards micro invasive procedures and patients will expect [it]. This is a primary characteristic of dental lasers. Moreover, patients will expect not only clinical results but convenience as relates to time and minimal discomfort with speedy recovery. To be competitive and attract a quality patient base, dentists must consider the addition of a laser as a technological advancement to their practice. Dr. Darbar: If 10 potential new patients approach your practice seeking laser dentistry and if three or five walk away because you do not, what would you do? It’s not a question of whether lasers work or do not or you can afford it or not, but: Can you afford to lose these patients on a regular basis? Its like implants when they came out the first time around and went and now came back; if you do not offer them to your patients, you are doing them a disservice and [it’s] ethically wrong. That’s the way lasers are going; like it or not, they are here to stay, and the laser learning curve and proper education is the key to implementing its use on daily basis. What is the one procedure that you depend on your laser the most? Dr. Kusek: I would not do a soft tissue procedure without the use of a dental laser: Frenectomies, tissue removal for biopsies, tissue troughing, pontic site development, orthodontic exposure of impacted teeth, flap reflection of tissues, gingevectomies, treatment of apthous ulcers, Laser Assisted Periodontal Therapies, pocket surgery, crown lengthening, implant uncovering, treatment of peri-implantitis, lip tuck procedures and use of photobiomodulation for wound healing. The ability to heal quickly with less bleeding than with the use of traditional methods separates the need to use a laser in the soft tissue realm. 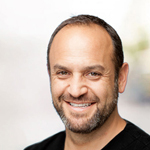 Dr. Kotlow: I am not sure that can be answered since I use my laser for all of my patient restorative as well as surgical treatments. 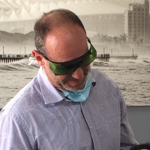 Dr. Hoopingarner: I use my laser most often in the preparation of the tissues prior to taking impressions. Obtaining a dry and open area below the margin of the tooth preparation prior to the taking of an impression is imperative to successful indirect dental restorations. The use of lasers enables me to do this faster, better and with less trauma than with the use of retraction cord packed in layers deep into the gingival sulcus. Dr. Low: Managing periodontitis with micro invasive laser techniques resulting with comparable clinical results to traditional surgery and, moreover, excellent patient acceptance. hard or soft tissue laser surgery for accelerated healing, pain management and better outcomes for the patient with minimum post-operative complications. Dr. Sun: I rely on laser energy to do my soft tissue surgery and management. “There is a huge amount of new technology on the market, but every once in a while something really amazing is developed that will really change the way we practice. The Biolase Waterlase is one such piece of technology. I have been using a soft tissue (Diode) laser for many years & have had great success. To now have a laser that is able to cut soft tissue, tooth & bone is like Harry Potter discovering magic for the first time. This is definitely one of those technologies that has revolutionized my practice. Being able to cut bone & soft tissue with minimal trauma & none of the vibration or noise of a normal drill is unbelievable & extremely beneficial for any patient especially those with dental phobias of any sort. 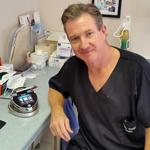 The addition of the laser to my treatment of gum disease has also expanded the treatment possibilities to include all the most advanced treatment methodologies which I was unable to perform before the Waterlase iPlus. Being able to use the laser on soft tissue without any anaesthetic is another unbelievable practice builder, it works for young children who need small soft tissue procedures done and it can be totally atraumatic for them. "There are many important benefits associated with Waterlase dentistry. Standard dental treatment using mechanical means is often accompanied by fear & pain for the patient. Although the pain may be reduced by local anesthesia, fear of the needle, noise & the vibration of mechanical instruments remain a cause of discomfort. Removal of caries is often a painful procedure & the pain is more intense in deep lesions close to the dental pulp. Compared to a traditional rotary bur, the laser is quieter & vibrates less. Instrumentation of the dental hard tissues can result in unwanted side effects. The friction developed by rotary instruments raises the temperature & thus increases the risk of thermal injury to the pulp. This means that, for the first time, many common dental procedures can be performed without local anesthesia. It also means that hairline cracks & other structural damage sometimes caused by vibrating drills are a limited. Lasers also allow the clinician to reduce the amount of bacteria & other pathogens in the surgical field. In the case of soft tissue procedures, achieve very good hemostasis with the reduced need for sutures & surgical packing. 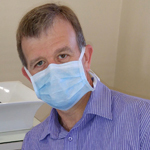 Periodontal diseased tissue can be disinfected & detoxified. Lasers can successfully & safely be used on a wide range of the population such as children & pregnant women unlike some prescribed medication. Unlike those medications, the patient will not experience allergic reactions, bacterial resistance, or side effects when the laser is used. “Having the Biolase Epic Laser has made a huge improvement to my cosmetic procedures. Doing things like frenectomies (tongue-tie) and troughing around my crown preps have become a pleasure for me and my patients!